I recently spoke with the CEO of exo² about their heated jackets, vests and gloves (for motorcycles). They also have heated insoles for your shoes, a 'heated back support' and are venturing into other markets to apply their innovative heating technology. There are no wires running up and down the jacket, no carbon fiber, and the heat is evenly distributed all the way across the front of the vest. The heating element is safe, doesn't create hotspots and won't drain your battery as it only draws 4.1 amps vs. 7-10 amps compared to similar heated vests/jackets. The StormRider Bodywarmer vest ($239) is a great option if you're looking for a vest that will fit a petite body size or need something that may fit a curvier figure. What you can't see from this picture are adjustments at the waist which will help you cinch the vest for a snugger fit closer to the body. The fit/cut is a European cut, which will benefit those of you who have narrower waists/torsos. As you can see from the infrared photo, the heating element covers the entire vest, so no place is left unheated! They also make a protective heated glove that runs down to a XXS! I haven't had a chance to try out their vest yet, but plan to once I'm back on the bike in January (fingers crossed). I hope to do a complete and full review at that point. In the meantime, check out exo² if you're looking for heated gear options. They've recently been added to the Parts Unlimited catalog, which virtually every motorcycle dealership has a relationship with. So if your local dealer doesn't carry them in the store, ask to see their Parts Unlimited catalog and you should find them there. Brrrrrr. I've contacted this company, Venture Heated Gear about their Scooter Vest to find out more about this vest, as well as the other motorcycle heated gear they are offering. Winter's coming and I know many of you are thinking about how to get ready for the cold. In the meantime, here are more than a couple of options currently out there just for the ladies. All these work with 12V connectors for your bike. The only one that is battery operated is #3, ActiVHeat. 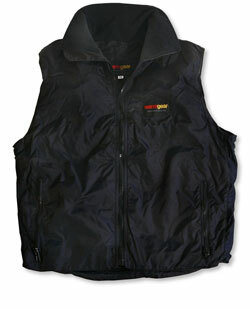 1) Gerbing Heated Vest $139.95 Gerbing is probably the most popular heated vests that people are using today. Before Widder went away, they were probably #1 and #2, respectively. 3) ActiVHeat Vest $119.99 - $174.99 Apparently this vest was recommended on the "Today"show. The testimonials are also very positive in endorsing this product. This vest runs on batteries (rechargable and AA). The prices vary based on the package you buy. The more expensive packages come with rechargeable battery packs, whereas the cheapest comes with only AA Batteries.